All transactions are safe and secure with a reliable history in online purchasing behind each of our associates. Buy the You Mad Bro? t-shirt to own Alice in Wonderland clothing and merchandise. 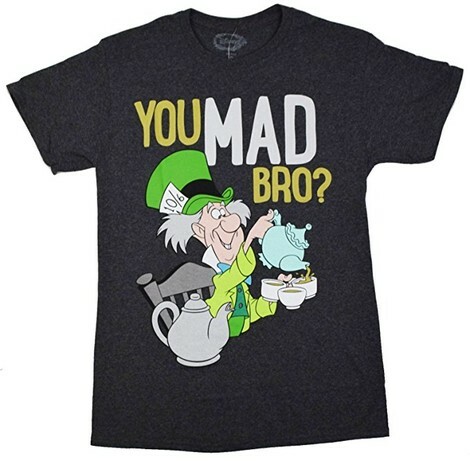 This Mad Hatter t-shirt features the question "You mad bro?" The image features Disney's depiction of the hatter from the Alice in Wonderland animated movie. The expression, "mad as a hatter", is the result of hatters exposure to mercury that was used for curing felt for hats. The poison caused speech and vision disorders that made the hatters seem mad. Now that you've had a history lesson, check out the Lewis Carroll books and Alice in Wonderland movies to experience the classic story for yourself. Also, the Alice in Wonderland costumes will put a smile on any child's face. In addition to the You Mad Bro? tee above, browse the Alice in Wonderland Clothing Gallery for more apparel like men's and women's clothes, kids shirts or hoodies.